"If I knew how to take a good photograph I'd do it every time"
I love the wry and only semi-sarcastic humor in this quote! Doisneau was a French photographer who died in 1994 and is most noted for his Parisian street photography. His most known photograph was made in 1950 - "Le baiser de l'hôtel de ville (Kiss by the Town Hall)" - seen below. "In 1950 Doisneau created his most recognizable work for Life – Le baiser de l'hôtel de ville (Kiss by the Hôtel de Ville), a photograph of a couple kissing in the busy streets of Paris,which became an internationally recognised symbol of young love in Paris. The identity of the couple remained a mystery until 1992. Jean and Denise Lavergne erroneously believed themselves to be the couple in The Kiss, and when Robert and Annette Doisneau (his older daughter and also his assistant at the time) met them for lunch in the 1980s he "did not want to shatter their dream" so he said nothing. This resulted in them taking him to court for "taking their picture without their knowledge", because under French law an individual owns the rights to their own likeness. 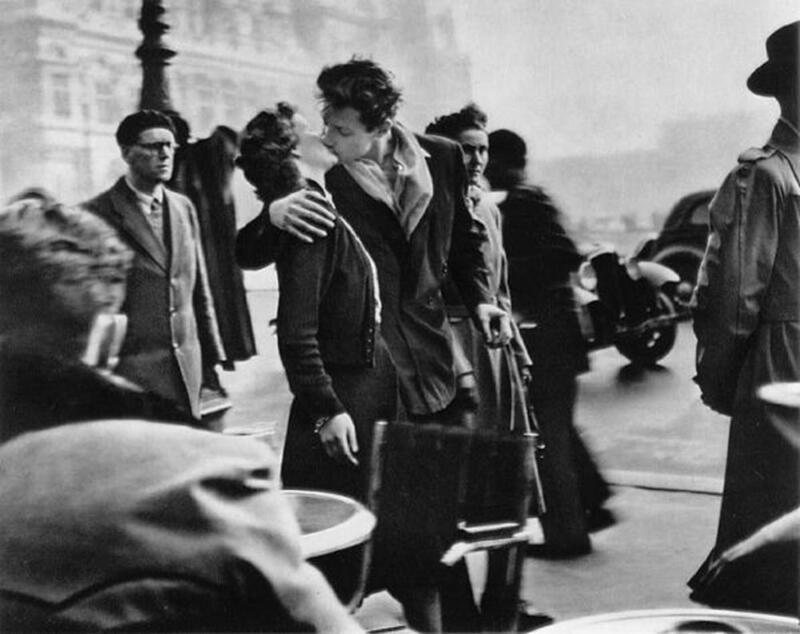 The court action forced Doisneau to reveal that he posed the shot using Françoise Delbart and Jacques Carteaud, lovers whom he had just seen kissing, but had not photographed initially because of his natural reserve; he approached them and asked if they would repeat the kiss. He won the court case against the Lavergnes. Doisneau said in 1992, "I would never have dared to photograph people like that. Lovers kissing in the street, those couples are rarely legitimate." The couple in Le baiser were Françoise Delbart, 20, and Jacques Carteaud, 23, both aspiring actors. In 2005 Françoise Bornet (née Delbart) stated that, "He told us we were charming, and asked if we could kiss again for the camera. We didn't mind. We were used to kissing. We were doing it all the time then, it was delicious. Monsieur Doisneau was adorable, very low key, very relaxed." They posed at the Place de la Concorde, the Rue de Rivoli and finally the Hôtel de Ville. The photograph was published in the 12 June 1950, issue of Life. The relationship between Delbart and Carteaud only lasted for nine months. Delbart continued her acting career, but Carteaud gave up acting to become a wine producer. In 1950 Françoise Bornet was given an original print of the photograph, bearing Doisneau's signature and stamp, as part of the payment for her "work". In April 2005 she sold the print at auction for €155,000 to an unidentified Swiss collector via the Paris auctioneers Artcurial Briest-Poulain-Le Fur"
It would appear that Bornet was well compensated for the kiss!